Willie Rodriguez was born and raised in NYC. His music study began in church where he learned to sing and play classical music. His piano playing quickly developed in all directions as he studied classical, salsa, jazz and popular music. Willie Rodriguez’ performances, tours and recordings are too long to list here, but they date back to the early 70’s with several known artists of the time and now. Willie Rodriguez is the pianist on two Grammy winning Albums “Machito and His Salsa Big Band” recorded in 1982 in Utrecht, Holland on the TimeLess Label. He is one of the pianists on the Grammy winning Celia Cruz album “La Negra Tiene Tumbao” 2002 on the SONY Label. He recorded with Johnny Pacheco “Entre Amigos” and is currently in his band. 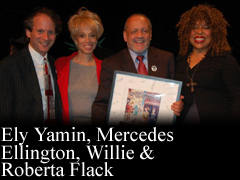 While a young performer and recording artist, Willie Rodriguez also taught music in the NYC public schools. In 1990, he went on to earn a Master in Education degree with a specialization in Administration and Supervision. He then became Assistant Principal of the Arts at DeWitt Clinton High School in the Bronx. In 2002, Willie Rodriguez earned a Doctorate in Music Education degree from Columbia University, Teachers College. Dr. Rodriguez’ dissertation “Creating a School of Music: a Bronx New Century High School Initiative” led to the opening, in 2003, of the Celia Cruz Bronx High School of Music. Dr. William Rodriguez was the founder and the Principal until 2013. In 2008, Willie Rodriguez, established NYPR Music Inc., a music business which produced his Latin/Jazz recordings, “Live at Willie’s Steakhouse” (2008) and “Live at Don Coqui” (2010), with Andy Gonzalez, Nicky Marrero, Roland Guerrero and Richie Mely along with guests Dave Valentin, Jimmy Delgado, Pete Nater and Steve Toure. Willie Rodriguez continues to lead his Latin/Jazz & Salsa group. It is available for booking and educational clinics. Dr. Rodriguez also works at Lehman College, CUNY as Director of External Relations with the Art & Humanities Department. He is also a supervising Professor of student-teaching at New York University and a music education consultant.